WARNING: Spoilers for Bastion within the article. You have been warned. It's a long way to the end. Guy looks at his keyboard, wonders what he's going to write. He gets this dumb idea that if he writes the entire thing in The Stranger's style, it'll be good enough. He's wrong, of course. …Aaaaand that's two down! I've finished Bastion, and now it's time for my writeup. Guy thinks he's hot stuff, writing things down like The Stranger. He's still got a long way to go. Don't know if he'll make it. 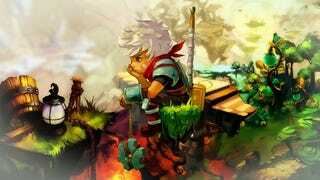 Simply put, Bastion is a really good isometric beat-em-up. You play as The Kid, guided by The Stranger, the game's narrator. The Stranger gives the player the history of the areas The Kid travels through, he quips on the various successes and failures of The Kid, and is probably the best part of the game. Guy's got a knack for figuring out what to put in the bits to make the transitions a little less awkward. It's paying off. At least, he thinks it is. There's a lot to like about the game. Let's start with the obvious: the visuals. I don't think that a literal apocalypse has ever looked as beautiful as it does in this game. Each of the three major regions has it's own distinct look: The City is filled with signs of civilization; The Wilds look, well, wild and overgrown, with signs that nobody's tried to tame this part of the world for a long time; and the Terminals feel very cold. There's also the matter of the gameplay. You fight with two weapons, a giant shield, a special skill, and a dodge/roll mechanic. The weapons are either melee or ranged; I ran around with a machete with bleed damage and a shotgun/musket that fired two shots with one pull of the trigger the entire run of the game. I experimented with a variety of other weapons when they were presented to me, but I found that I preferred the playstyle that the machete/shotty combo offered. The skills are typically tied to the weapons equipped, meaning that you can't equip a skill if you don't have the weapon equipped as well. There are a few skills that you can equip regardless of what weapon you're using; for instance, a decoy that pulls aggro from enemies within range and allows you to perform a sneak attack on the unsuspecting foes. Then there's the soundtrack. It's really good. Go give it a listen (and maybe buy it? ), and come back and tell me that it's not good. I've had "Setting Sail, Coming Home (End Theme)" in my head for the last two days (At the time this was written, I had beaten the game two days ago; writing this has been harder than it should have been). Guy's finally on a streak. He's figured out not to use The Stranger's style as a crutch; rather, he's using it to accent the piece, to spice it up. He's nearly there. He knows it. What's Left To Write About? It's a good story, with The Stranger narrating everything, detailing the history of Caelondia, the Wilds, the Ura and the Terminals, and everything in between. There's pangs of nostalgia in the voice, an excellent performance from Logan Cunningham. I feel the game is about letting go. The Caels couldn't let go of their conflict with the Ura, and it wound up costing them their lives and their city. Zulf couldn't let go of his anger against the Caels, and as a result, he was either cast out of the remaining Ura tribe or brutally murdered (depending on what you chose). The Stranger couldn't let go of the past and advocated choosing the Bastion's restoration protocol, and if you chose to enable said protocol at the end, it takes you back in time to relive the Calamity. The only way to break this endless cycle of everyone reliving the Calamity is to let go of the past, and to enable the evacuation protocol. Saving Zulf doesn't change his status with the Ura (they still hate him for bringing The Kid to the Terminals, resulting in the death of several Ura who had survived the Calamity), but it is symbolic of The Kid letting go and forgiving Zulf for nearly destroying the Bastion. The end is so near, the Guy can feel it. Every fiber in his being is cheering him on. He had it in him to finish the thing all along. He just needed a little push, a little nudge to finish. With this article taking much longer to write than originally anticipated, I've switched around games. It was originally going to be Tomb Raider (2013), But I've decided that Dishonored would be a better game to move on to, as it's shorter than Tomb Raider (2013) and I could leave the longer game until the end to have a large marathon push to the end. Full disclosure: I've already played the first level of Dishonored, and have gotten the prompt to start the second mission, but I'll be starting fresh for this playthrough. I also won't be doing the Knife of Dunwall / Brigmore Witches DLC until after my Four are finished. Additional note: If Hotline Miami 2: Wrong Number comes out in the middle of my Dishonored run (or Tomb Raider (2013), for that matter), I will stop playing it in order to focus on Hotline Miami 2. It's over. The Guy can rest, but not for long. He's still got a long way to go, and a little over half his time left to do it in. He feels he can do it. Wonder if he can.